--from The Parables of Jesus - Vol I . * If you're using a paper plate, line the bottom with a round piece of wax paper. Before class copy the Prayer Hand pattern onto colorful paper. Bend paper clip into a u-shape and insert it into the side of the paper plate (this will be used to hang the prayer hand when dry. You will need to cut the paper plate away from the clip once it's dry). Mix plaster according to package directions. When the plaster is the consistency of peanut butter, pour approximately 16 ounces into the paper plate. Lightly tap plate on table surface to release air bubbles. Allow the plaster to rest for about 5-15 minutes until it's able to mold a hand print, then test it and see if it retains the print, if so, proceed. If not, tap plate to smooth plaster out and try again a minute or two later. Don't let the plaster completely harden. Once the plaster is ready, place hand into the center of the plate with fingers spread apart. Keep hand in plaster until it retains the print (a few seconds). 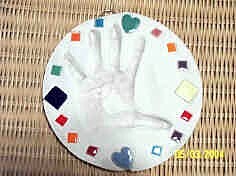 If you're using tiles or beads, press into plaster around the handprint. Allow plaster to dry for several hours. Once plaster is dry, cut plate away from the paper clip and turn upside down to remove the plaster handprint. Glue the Prayer Hand pattern with the Lord's Prayer and five key parts of prayer onto the back of the plaster handprint (from The Parables of Jesus Vol. I). Optional: Write name into the wet plaster, press bits of small tile or beads into the wet plaster around the outside edge of the handprint, or after the plaster dries, sponge paint around the edge of the handprint. What are some things you've asked your parents to give to you? (clothing, toys, food, playtime together, etc.) Do you usually get what you ask for? Why or why not? Have you ever asked your mom or dad for a sandwich and were given a rock instead? Or for clothing to wear and given rags to put on? Why not? (Because they love you and want the best for you.) Is getting what you want always the best thing for you? Why or why not. One day Jesus was praying, and when he had finished talking to God, one of his disciples wanted to know if there was a special way to pray. So he asked Jesus to teach them to pray. Jesus said to them, "When you pray, say: 'Our Father who art in Heaven, hallowed be thy name, thy kingdom come, thy will be done on earth as it is in heaven. Give us this day our daily bread. And forgive us our debts, as we have forgiven our debtors. And lead us not into temptation, but deliver us from evil. For thine is the kingdom and the power and the glory forever. Amen'." (Rephrased from Luke 11:2-4 and Matthew 6:9-13). 1) Thumb: ADORATION - "Our Father who art in Heaven, hallowed be thy name." We begin praying by worshipping God. He is a Holy God that deserves our praise. 2) Pointer Finger: SUPPLICATION - "Give us this day our daily bread." 3) Middle Finger: CONFESSION - "Forgive us our debts." Tell God that you have sinned against him. Admit what you've done wrong. Ask him to forgive you and thank him that he does forgive you. 4) Ring Finger: INTERCESSION - "As we have forgiven our debtors. Lead US not into temptation but deliver US from the evil one." (The entire Lord's Prayer is a corporate prayer of OUR, US and WE, whereby we pray for ourselves and others.) When we pray for others, we are interceding for them. In other words, we are asking God to help them. Do you know someone who is sick? Then ask God to heal him or her. Do you know someone who doesn't know Jesus? Ask God to make himself known to that person. 5) Pinkie Finger: PRAISE - "For thine is the kingdom and the power and the glory forever." End prayer by thanking God for saving you and forgiving you of your sin. Thank him for loving you and taking care of you. Give honor and respect to God. After Jesus told his disciples how to pray he told them a story about a friend in need. Read Luke 11:5-8 from a child-friendly Bible, or use the Friend In Need skit (the rest of this lesson may be found in The Parables of Jesus - Vol. I). For another craft project on the Lord's Prayer, check out our Prayer Wheel.